Hats on the hill do one of two things; keep you warm, or keep the sun off your head thus keeping you cooler. The latter is sometimes forgotten. There is a common misconception that the head can be responsible for about 40% the body’s heat loss, but in actual fact it’s more like 10% (apparently the experiment that proved the 40% was a flawed one.) 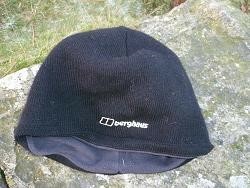 However, on top of a hill in the wind or cold, whatever the true heat-loss, life without a hat can be cold indeed. Adding to the general cold is ear-ache from the wind, which is not a pleasant experience. There are many types of hat these days: woolly ones, fleece ones, Gore Tex ones lined with fleece, and various others. Having a cheap woolly hat is better than nothing. They sometimes blow away, so also worth considering taking a spare. In summer a baseball type cap is advisable to keep the sun off your head and face, but you may find that you swap it for the warm hat as you get higher up the mountain. A warm hat is an essential piece of kit for all times of year. The valley may be nice and sunny in summer, but when you’re at 3,000 ft, it's likely to be 6° C cooler with at least twice the wind speed. Always take a hat.